1PZ Brand are well known for high quality product with a BOW DOWN price. We guarantee 100% money back if you are not satisfy with the quality. We have a friendly and dedicated support teams to handle any problems you come up with our products. Please contact us first via email or message for replacement, refund or technical problem caused by any reason. We promised you won’t lose one cent on shopping with 1PZ Brand. It fits a lot of applications with the M10 adapters. They fit on both 8mm or 10mm mirror thread. 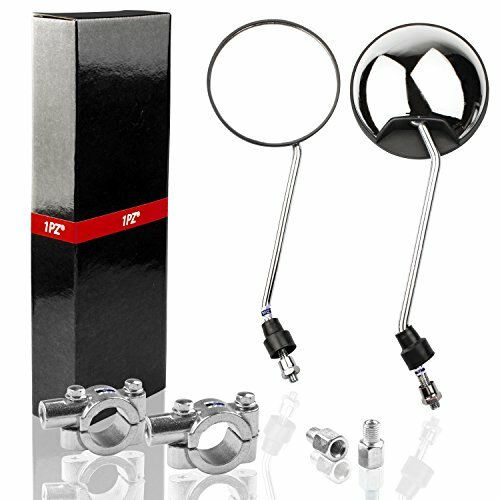 Package Comes with Left and Right Mirror, 2 Thread Converter and 2 Clamps, Easy Installation.